Foggy vision can cast a dark cloud over your day-to-day activities, from running errands to spending time with loved ones. Symptoms of cataracts include seeing halos around lights, blurred or clouded vision, light sensitivity, double vision, and seeing colors as faded or more yellow than they actually appear. You’ll be relieved to know, cataract surgery has come a long way over the years, and it is now one of the most successful surgeries performed in the United States. Cataract surgery is one of the oldest surgical procedures in the book, and the first cataract extraction was documented in the 1700s. Since then, advancements have been made in surgical techniques and intraocular lens replacement procedures. During cataract surgery, the cloudy natural lens is broken up by sound waves and removed from the eye. The surgeon then inserts a new, permanent prescription lens in its place. Our very own Dr. Mike McFarland developed a procedure called “No-Stitch” cataract surgery. “No Stitch” surgery allows the eye to naturally heal itself without the use of sutures and stitches. It’s performed on an outpatient basis, using only a small corneal incision to break up the clouded lens. The lens is then washed away and replaced with an intraocular lens. Recovery time is minimal, and patients can get back to their normal routines without a hospital stay. Dr. Mike McFarland trained the team at McFarland Eye Care on “No Stitch” cataract surgery, so you can rest easy knowing that your eyes are in skilled and experienced hands. The medical professionals at McFarland Eye Care have been performing cataract surgeries for years, including traditional cataract surgery (both with and without astigmatism correction), laser cataract surgery, and laser cataract surgery with refractive lenses. Don’t let cataracts cloud your outlook on life. Contact us today, and see the future in a new light! forget about entirely: protective eyewear. provide different levels of support, and they exist for a reason! there’s no going back. That’s why prevention is of utmost importance when it comes to eye care. in the face by a pitch, which damaged his retina, dislocated his jaw, and cracked his cheekbone. promising baseball career due to an injury that changed his entire life. it comes to your vision. Protect your eyes while engaging in any sport that can lead to an eye injury. Put Your Best Face Forward for Summer! We’re so excited to announce our cosmetic surgery special for the month of April! If you’ve been eager to get an eyelid lift, brow lift, or a reduction of bags around the eyes to freshen up your appearance just in time for spring and summer, now is the time to do it! Get ready for selfie season! Dr. Wilkes is offering $500 OFF any cosmetic surgery he performs throughout the month, but you must have your personal consultation with Dr. Wilkes by April 30 at the latest! To see the cosmetic surgery services we offer, click here. To learn more about Dr. Wilkes, and hear what his patients are saying, click here. Schedule your personal consultation with Dr. Wilkes today! Save Your Vision Month - Is there anything you can do to save your eyes? Just open your eyes. Seeing is one of the easiest things you do and something that many of us take for granted. Whether working or playing, our vision is an important part of our everyday life. March is Save Your Vision Month and the American Optometric Association’s main focus for this event is to increase awareness regarding eye care. During this month, let’s learn some important things you can do to protect your eyes. A regular eye exam leads the way in protecting your vision. Most of us don’t think about eye care until something goes wrong, however many eyesight issues are detected during an eye exam. Early diagnosis and treatment of eye diseases is often crucial to preserving good vision. Remember to schedule your regular eye visit just like you do a visit to your dentist. Save Your Vision Month is also focused on the new issues brought about by the hours we spend looking at screens. Today, almost every workplace has a computer at each desk. Many people who stare at computers for long stretches complain of dry eyes, blurry vision or eye strain. To protect your eyes in the workplace, you should sit about 20 inches from your monitor and take breaks at regular intervals. It’s a good idea to just get up and walk to a window and look outside. Also remember to blink because when staring continuously at your monitor, you will blink a lot less than normal. Another culprit we need to protect our eyes from is the prolonged use of our digital devices. The average American spends seven or more hours per day looking at smartphones, tablets and flat-screen TVs. These devices emit blue light and overexposure to this specific type of light can negatively impact eye health and cause eye strain. American Optometric Association suggests the 20-20-20 rule to protect your eyes. After 20 minutes of exposure, take a 20 second break to view something 20 feet away. Last but definitely not least, remember to wear sunglasses to protect your eyes from damaging UV rays and remember to wear them year round, not just on sunny, summer days. During Save Your Vision Month, it’s important to take steps to protect your eyes and don’t take your precious vision for granted. One of the most important things to remember to bring for you and the family are your SUNGLASSES! Enter our Facebook giveaway for FREE Ray-Bans® here! Sure everyone looks cute and cool in sunglasses, but aside from that, why do sunglasses matter? First and foremost, there are three reasons sunglasses help protect the eyes. The first is the retina inside the eye where light-sensitive nerve tissue lives must be protected. Wearing sunglasses protect these photoreceptors from UV damage. The second is the lens of the eye; nearly everyone will eventually develop some clouding of the lens which is known as cataracts. Protecting the eyes from the sunlight may slow the progression of cataracts. Lastly, skin cancer on the eyelids should be a concern. Protection from sun exposure to this sensitive area is recommended especially in patients with a history of skin cancers. Another perk of those sunglasses is helping to avoid wrinkles around the eyes due to squinting in the bright sunlight. Be selective when shopping for your sunglasses. Darker lenses are not necessarily better. Always double check to make sure they have 100% UV protection. Look for labels with broad-spectrum (UVA and UVB) coverage. Polarized lenses are helpful because they reduce the glare caused by light reflecting off surfaces such as water or snow. Larger frames provide more coverage of the skin and block more of the sun’s rays. Every added layer of protection helps reduce the risk of eye damage. Don’t think the sun doesn’t bother you and don’t ignore the warnings because you don’t want to get the “owl eyes” sunglass tan. Remember everyone is affected by the damaging UV rays and your vision is important! Even the youngest of children should be encouraged to wear sunglasses. Sunglass shopping can be fun but it can also be difficult to decide with all the options available. Come visit our optical stores and we will help you find the best pair of sunglasses for your lifestyle. As you make your family plans and get ready for outdoor fun during Spring Break, don’t forget your eye health does matter so protecting that priceless vision with sunglasses does matter too! Have you ever caught a reflection of your profile and noticed you have your grandmother’s double chin? Have you worked hard to lose weight and been disappointed with the sag that still remains below your chin? Do you look at selfies and think you look heavier and older than you actually are? If this condition makes you feel self-conscious, you will be relieved to know there is a solution tailor-made just for you offered by our doctors here at McFarland Eye Care. Meet Kybella®. What exactly is Kybella®? Kybella® treatments are injections of a deoxycholic acid. The acid is bile acid, which your body naturally produces and helps your body absorb fat. Kybella® is a medical treatment created to improve your profile and reduce the appearance of a “double chin” (also called submental area). It is a non-surgical way to reduce the fullness under the chin. During a consultation with our doctors, they will determine if you are a good candidate. They will discuss your medical history, as well as any cosmetic procedures you have had done on your face or neck area. They will explain the procedure and guide you through what to expect. Generally, topical icepacks applied to the area achieves adequate anesthesia. Once that has taken affect, then you will receive multiple injections under the chin. You can expect up to 20 to 30 injections of Kybella®, which will gradually start working to kill the fat cells. You should also plan on having at least two sessions of Kybella® injections. You and your doctor can decide if more sessions would be effective and beneficial. Since it is a non-surgical procedure, little preparation is required, and the recovery process is minimal in most cases. Minor side effects usually subside in one to two weeks. The good news is over 80% of patients reported significant changes in their appearance. Even better news is that once the deoxycholic acid destroys fat cells in the submental area, the results should be lasting. No further treatment is expected as the cells can no longer store the fat. So if that “double chin” is something you have noticed recently or have had your whole life, you should consider Kybella®. Enjoy your updated profile and post those selfies! What's the Difference in an Optometrist and Ophthalmologist? An optometrist is an eye doctor who has earned a Doctor of Optometry (OD) degree. They generally complete a four-year college degree, plus four years of post-graduate training in optometry school. The ophthalmologist is a medical doctor (MD) who has completed four years of college, four years of medical school, one year of internship and a three-year residency in ophthalmology. vision loss in people over 60 and affects as many as 1.8 million people in the United States. what are the types? There are two forms of AMD: dry and wet. gaps or dark spots or colors fading out. bent. It is also possible for early-stage dry AMD to change into the wet form of the disease. complete loss of central vision. you are experiencing any changes in your vision. For more reading, here are 7 things you should know about macular degeneration. We’re so excited to announce our Spring Break LASIK Special for teachers and students!!! This spring break is the perfect time to ditch your glasses and contacts for good! Save $800 on LASIK at McFarland Eye Care! One day only – March 18, 2019. This LASIK discount only applies to teachers and students – must show ID at evaluation. This offer cannot be combined with any other offer. Schedule your FREE LASIK evaluation today and hold your spot for our LASIK Spring Break Special! Want candid, honest, firsthand info on LASIK? Click here! Who Needs A Glaucoma Screening? January is National Glaucoma Awareness Month, a time to spread the word about this sight-stealing disease. Glaucoma is called “the sneaky thief of sight” because as much as 40% of vision can be lost without a person noticing. Over three million Americans have glaucoma and combined with our aging population, an epidemic of blindness is looming if we don’t raise awareness about the importance of getting glaucoma screenings. Who needs a glaucoma screening and when should they start? Those at a highest risk of glaucoma include African American and Latino populations. African Americans are over six times more likely to have glaucoma than Caucasians. People with diabetes are twice as likely to develop glaucoma. Other increased risk factors are those with an immediate family member who has been diagnosed with glaucoma and anyone over the age of 60. Also, if you are severely nearsighted, you fall into the high-risk category. Learn more about glaucoma here. During National Glaucoma Awareness Month, we are excited to announce FREE glaucoma screenings at all four of our locations. Call us to sign up for your FREE glaucoma screening during the month of January. Most New Year’s resolutions revolve around improving yourself, so why not consider improving your vision in 2019? Are you tired of waking up and reaching for your glasses because the room is blurry or struggling every day with contacts? LASIK surgery may be the answer to make your new vision resolution a reality. #1) No more glasses or contacts - Imagine being able to work out or play a sport without your glasses bouncing on your face or experiencing sweat and dirt irritating your contact lenses. LASIK can improve your overall quality of life and can make the little things like actually seeing your face when doing your make-up or being able to wear regular (non-prescription) goggles when you ski or swim less of a hassle. #2) LASIK is usually a painless procedure - Most of our patients say they don’t feel any pain at all during LASIK. You will be given a mild sedative to help you relax before the procedure and then we apply numbing eye drops. LASIK does not hurt during the procedure; however you may feel some pressure on your eyes which is normal. Even after the numbing eye drops have worn off, you shouldn’t feel any pain or discomfort. Recovery time is very minimal for most patients and some can usually return to normal activities within two days after the procedure. #3) LASIK is affordable – Affordable LASIK is within your reach, and one payment option is your Flexible Spending Account (FSA) or Health Savings Account (HSA) offered through your workplace. LASIK is considered a qualified medical procedure for your FSA/HAS, and many plans have a grace period extending a couple of months into the new plan year. So, if you have leftover money from 2018, hurry and take advantage of using those pre-tax dollars to pay for your new vision in 2019. But, if you have already used those funds, we also offer an affordable payment plan through CareCredit to finance your LASIK procedure at 0% Intertest for 24 months. #4) LASIK is safe – As with any surgery, you should do your homework and understand the procedure. Having concerns about the safety of LASIK surgery and your eyesight is normal. However, LASIK is the most frequently performed elective surgery and complications are very rare. At McFarland Eye Care many of our team members have had LASIK, including our surgeon, Dr. Evan Newbolt. #5) LASIK patients say they wish they had done it sooner - We find that many patients think about the surgery for years before they actually do it and then share that they wish they would of had it done sooner. LASIK provides immediate results to the patient’s vision and it improves throughout the healing progresses. It is truly life-changing. Read Sven’s story here about how LASIK changed his life, or read Timie’s! Contact our office to schedule a consultation or get information about using your FSA/HSA funds for your LASIK procedure. In 2019, why not resolve to enjoy your new year and your new vision? Although it affects over 25,000 Arkansans, patients often walk into our clinics who don’t know their vision is being compromised by glaucoma. January is Glaucoma Awareness month, so here are the five things you need to know about glaucoma. #1) What is Glaucoma? Glaucoma is a group of eye conditions where optic nerve damage often occurs when the fluid pressure inside the eye increases. It is the second leading cause of blindness, but it is THE leading cause of blindness that CAN be prevented. #2) What are the risk factors of glaucoma? African, Hispanic or Asian heritages have the highest chance of developing glaucoma. People with diabetes, a family history of glaucoma or are severely nearsighted are also considered high risk. The risk for developing glaucoma increases with age, so if you over the age 60 you should be mindful to have regular eye doctor visits with glaucoma screenings. #3) What are the common symptoms of glaucoma? There are usually no early warning signs or noticeable symptoms. In fact, most do not recognize any symptoms from the disease until they begin to experience severe vision problems. Other patients complain of severe pain in the eye or start to notice blurred or narrowed field of vision. #4) What are treatments for glaucoma? The most common treatment for glaucoma is eye drops. These topical medications work by decreasing the eye pressure if used appropriately. For individuals who do not tolerate or respond to eye drops, laser procedure can be performed which improve the fluid outflow from the eye. #5) How is glaucoma diagnosed? The only way to diagnose glaucoma is a complete eye exam with dilation. To dilate the eye, drops are placed in each eye to widen the pupil and allow better viewing of the inside of the eye. After the doctors test your vision, they will measure your eye pressure, perform a Visual Field test and examine your optic nerve for signs of glaucoma. Glaucoma damage is permanent – so PREVENTION is KEY! Early detection and treatment is vitally important to prevent vision issues. During National Glaucoma Awareness Month, we are excited to announce FREE glaucoma screenings at all four of our locations. Call us to sign up for your FREE glaucoma screening during the month of January. Mom was right when she warned you, “you can put an eye out with that!” And during the holiday season, the dangers are real. Eye safety is always important, and being aware of the common seasonal accidents can help you avoid a trip to the eye doctor or the emergency room. Many Christmases have been spoiled by eye injuries from the toys meant to bring joy, but thankfully, since 1972, the Consumer Product Safety Commission has made Christmas mornings a little bit safer. Gifts such as Jarts (giant metal yard darts) and Chemistry Sets that included explosive materials have been banned. However, children’s wish lists still include Nerf guns, air soft guns, or slingshots. In fact, over 20% of all eye injuries are caused by propulsion toys. Make sure if gifting these toys that they include the proper safety accessories. Don’t forget to make age appropriate selections, give proper instructions, and offer parental guidance with any hazardous toys. The holidays offer many other opportunities for eye injuries. Just putting up your tree with its prickly needles can pose a danger to your eyes. Make sure to wear proper eye protection if you are headed to the woods to cut down your own tree. Accidents have also occurred while decorating, whether a tumble into the tree from a wobbly ladder or just reaching in to plug lights and inadvertently getting a tree needle in your eye. The beautiful frosted spray snow can be an eye irritant if it is sprayed above your face. Glitter, spun glass (angel hair), and fragile glass ornaments can also cause damage to you or your children’s eyes. Remember when working around your tree or garland, eye protection is always a good idea. A new trend in holiday decorating is the dazzling Christmas laser light shows. These laser lights project onto the outside of your home and display beautiful designs. But you have to be careful not to look directly into the light when setting up your show. Laser lights can do permanent eye damage, so be sure to be safe when setting it up. Many people also enjoy celebrating Christmas and New Years with fireworks. Fireworks should only be handled by an adult wearing protective safety glasses and discharged from a secure distance away from family and friends. Over half of the fireworks-related injuries are suffered by innocent bystanders and most are eye injuries. Enjoy your fireworks display, but please be aware of the potential dangers and remind everyone to point those “party poppers” away from people’s faces. Lastly, don’t forget the bubbly! Mishandled champagne corks can fly out at an incredible speed. Every holiday, doctors see numerous eye injuries from these errant corks. Make sure to point the bottle at a 45-degree angle away from your face and your guests. It is also recommended to place a towel over the top of the bottle. The lights and festivities of the upcoming holidays are truly a beautiful thing. Just remember to practice eye safety so you can enjoy all the sights for years to come. We hope some of these helpful tips and words of caution for avoiding eye injuries will make this a joyful, safe holiday season for you and all of your loved ones. Do you have a Flexible Spending Plan (FSA) through your workplace or employer? Many people have access to this account that allows you to set back money for health expenditures on a pre-tax basis without knowing it! This means that during your enrollment period, you can allot money for qualified medical procedures from your pay before taxes. When money is held back on a pre-tax basis, it means that the amount is not taxed at that time, giving you more money to spend on a qualified procedure (like LASIK). This is a useful tool when used to cover known expenses (like a planned procedure) or deductibles. As open enrollment season approaches, it’s a good idea to determine how much - if any - money to put back on a pre-tax basis for the upcoming year. It’s important to think this through, because often this money is not rolled over into the next year and must be spent in the year that it is set aside. Many people chose this time to schedule elective procedures such as LASIK so that this money does not go to waste. Or, you can elect to use it for cosmetic procedures or treatments such as Kybella. These funds can also be used in conjunction with other payment methods (such as Care Credit) to pay for a procedure. If you are curious about using FSA funds for a procedure at McFarland Eye Care, let us know! We can help! Dr. Mike McFarland Wins Best of the Best in Ophthalmology! We are SO excited to announce that Dr. Mike McFarland has been voted “Best of the Best” in Ophthalmology by the readers of the Arkansas Democrat-Gazette! Those of us who work for Dr. McFarland know that he is a history-making, exceptional eye surgeon who has made tremendous contributions to Ophthalmology - including the invention of “No-Stitch” Cataract Surgery! We also know him as a genuine, kind and humble person who never stops learning or growing. We are so excited that he has, yet again, received this honor! We think the world of “Dr. Mac” and we are thrilled that our patients do, too! He will also be the first to say that his success is all about the team of doctors and staff at McFarlands. His theory is that people vote for him because they know his name… but they are really voting for their positive experiences at McFarland Eye Care, which is made possible by the dedication of all our doctors and team members. For nearly 40 years, ophthalmologist Mike McFarland, M.D., and the staff at McFarland Eye Care have worked to provide loving care using the most advanced technology. This year, Arkansas Democrat-Gazette readers showed appreciation for McFarland’s work by voting him Best Ophthalmologist in the Best of the Best contest. In 1981, he opened McFarland Eye Care in Pine Bluff, where he said he revolutionized cataract care by inventing no-stitch cataract surgery in 1990. He later opened additional clinics in Hot Springs, Little Rock and Bryant. McFarland and his team handle all kinds of eye-care needs, from routine vision maintenance to procedures such as laser-assisted cataract surgery and ophthalmic plastic surgery. He said he works to stay on the cutting edge of technology, using the latest equipment and techniques to deliver exceptional results to his patients. McFarland added that his practice would not be successful without his team of nurses, physicians and support staff. “I’m like a proud parent when I hear people talking about my doctors and my staff,” he said. “I get to work with some of the finest people that I’ve ever known, not just professionally but personally.” Staff members cultivate deep relationships and share their lives with one another, he said, adding that they read Scripture together in the morning. McFarland said his Christian faith plays a major role in his work. Request an appointment with one of our award-winning doctors by completing the form below. As your skin loses elasticity over the years, it can become susceptible to the pull of gravity and the brow line falls. This results in forehead wrinkles and sagging skin around your eyes that can make you look tired, upset and even angry — the opposite of how you want the world to see you. Brow lift surgery (also known as a forehead lift) can reverse the effects of aging and can give a natural contour to your face shape, lids and brows. A brow lift opens up the eye area giving you a youthful, refreshed look. 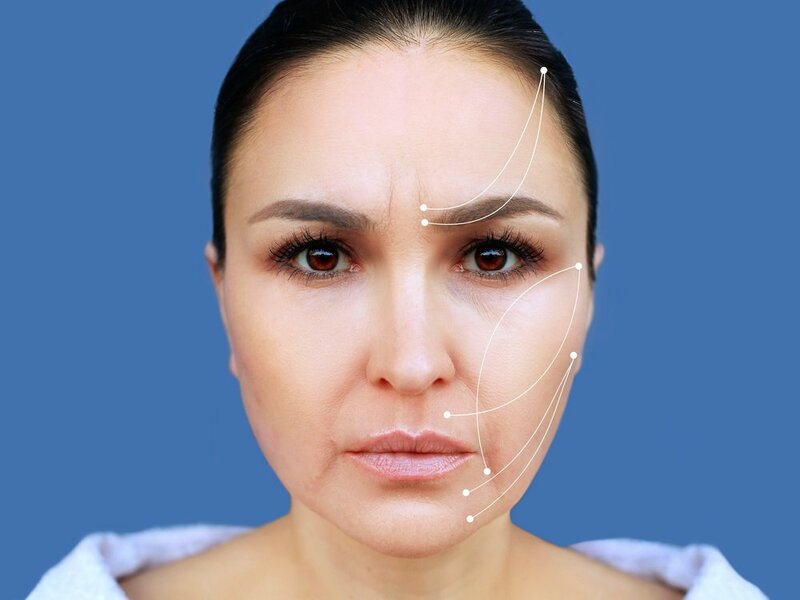 During your personal consultation to define your appearance goals, Dr. Byron Wilkes will make recommendations based on your unique anatomy and the extent of correction needed to achieve your desired results. There are varying brow lift methods, which involve different length incisions in different locations. In most cases, brow lifts are completed using the standard surgical method (incisions created at the hairline). The surgery is performed by Dr. Byron Wilkes, our Board-Certified Oculofacial Plastic Surgeon. Our surgeries are performed in our outpatient surgery centers located in Pine Bluff and Little Rock. You will be given light monitored anesthesia and Dr. Wilkes will usa a local anesthetic to numb the incision site. Once the operation is over, the the incisions will be closed with stitches or staples. Your forehead may be taped, and your head might be loosely wrapped to reduce any swelling. The surgery typically lasts just one hour. It is common to experience some swelling and bruising or to feel sensations of tightness or numbness on the forehead. We will provide you with a list of post-operative instructions to follow, to ensure that your recovery is as complete and comfortable as possible. Most people can return to work within seven to ten days, depending on your own personal rate of recovery. Results typically appear within a few weeks, revealing smoother forehead skin and a more youthful, rested appearance. However, final results should not be expected for several months. It’s completely normal to go into a procedure like this with plenty of questions. Don’t hesitate to ask Dr. Wilkes any of them! Preoperative stress and anxiety are completely normal, and at McFarland Eye Care, we want to do all we can to put your mind at ease. To learn more about brow lift surgery and find out if it's right for you, schedule a personal consultation with Dr. Byron Wilkes. The Bad News – bags under the eyes are common as we age. The mild swelling and puffiness increase as the tissues around our eyes weaken and sag. The normal fat pads that help support the eye can move into the lower eyelids. This causes the lids to appear puffy and may lead to swelling due to fluid accumulating. The Good News - bags under the eyes are rarely a serious medical condition but more of a cosmetic concern. It is also common to have dark circles under the eyes at the same time, which appear because the thin skin of the lower eyelid can become translucent and reveal the underlying blood vessels. There are many factors that can cause or even worsen the appearance of under-eye bags and dark circles. In addition to aging, the common culprits are fatigue, allergies, smoking, crying or fluid retention from excess alcohol or salt intake. The cause of bags can even be hereditary. Although many creams do claim to treat bags under the eyes, no topical cream can address the structural issue of lower eyelid changes. The creams will make the skin appear smoother and cosmetic concealers can be used to mask the dark circles under the eyes. Also, some articles recommend using sliced cucumbers or frozen tea bags as treatment methods. It is actually the coldness that constricts blood vessels and reduces the swelling and not the cucumber or tea bag itself. Remember, food sometimes contains bacteria and putting a possible contaminated source directly on the eyes can lead to eye infections. We recommend just using a clean washcloth soaked in ice cold water. Also, another home remedy is hemorrhoid cream, which can actually do more harm than good. The cream may contain steroids and when used on the sensitive skin around the eyelids, can cause irritation. We understand that puffy eyes are not your favorite look. If you are concerned about the appearance of bags or dark circles under your eyes, medical treatments are available at McFarland Eye Care. Our surgeon, Dr. Byron Wilkes, has undergone specialized training in Oculoplastics, better known as oculoplastic surgery, which combines both eye and plastic surgery together. Depending on what is causing the bags under your eyes, outpatient plastic surgery may be your solution. Before pursuing surgery, you may want to rule out other possible causes of under-eye bags such as an allergy, infection or thyroid disease. Cosmetic surgery is 25% off for the month of September only so book your consultation today! The Best News - even though the bags and dark circles under our eyes make us look tired and older than we really are, the treatments available at McFarland Eye Care can reverse the signs of aging and restore the face we remember in the mirror. For more information, contact us to schedule your personal consultation. You can ask most people what they know about cataracts and you will probably hear a combination of things like “my grandmother had cataracts” or “my doctor said I’m starting to develop cataracts”. It is surprising for an eye disease that affects roughly half of all older Americans – that is all they know about cataracts. 1. Cataracts are not on your eyes, they are in your eyes. A cataract is a clouding of the lens and most assume it develops on top of the lens, but it is actually inside the eye. Clumps of protein build up in the eye and the lens becomes less transparent. The lens must be clear for the retina to receive a sharp image. 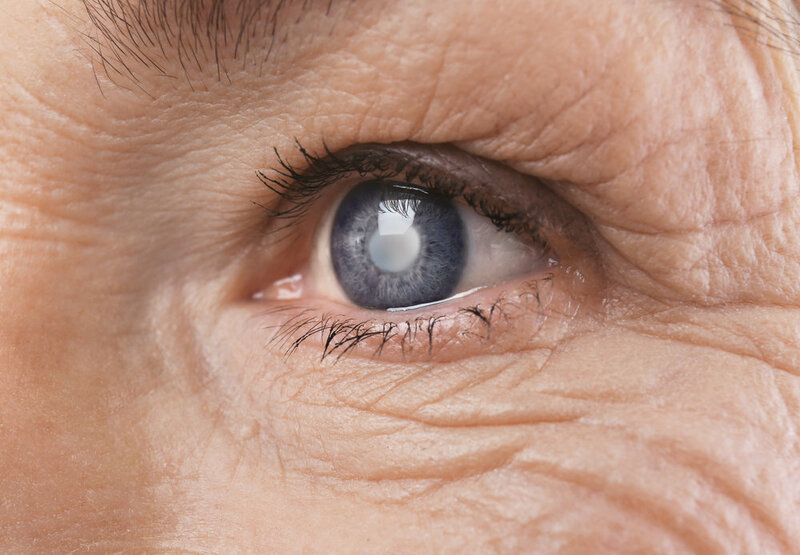 Cataracts affect almost 25 million Americans. More that 3.5 million cataract surgeries are performed annually and it is one of the safest, most effective types of surgeries. The Boomer generation is opting to have cataract surgery earlier than their predecessors and the average age for surgery has dropped to 65. Cataracts are not painful and usually form slowly, so you may not know you have them until they start to block light. Your vision will become cloudy, blurry or foggy. Some people complain of problems driving at night due to the glare of oncoming headlights. Any changes like double vision, nearsightedness or the way you see color, could be symptoms of cataracts. 4. How is a cataract detected? Cataracts are detected during a comprehensive eye exam that includes an eye chart test and a dilated eye exam. The doctor will place drops in your eyes to widen (dilate) the pupils and examine your retina and optic nerve for signs of damage. 5. There are different types of cataracts. Senile cataracts are the most common form and are age related. Secondary cataracts are caused by diseases such as diabetes or some medications. Traumatic cataracts result from eye injury such as cut or chemical burns. Childhood cataracts can be linked to congenital disease or a disease during pregnancy. 6. Who is at risk and can you reduce your risk factors? Cataracts are most often related to age. However, we can reduce our risk factors. Cataracts can be related to sun exposure; therefore wearing sunglasses with UV protection can reduce the harmful effects. Healthy habits such as not smoking, limiting alcohol and loading up on antioxidant-rich fruits and veggies can also help. 7. What is the treatment for cataracts? Surgery is the safe and effective option for treating cataracts. Our skilled surgeons use a procedure called “No-Stitch” cataract surgery, which was developed by Dr. Mike McFarland. This type of surgery is now the global standard for treating cataracts. With “No-Stitch” cataract surgery the eye is allowed to naturally heal itself without the use of sutures. During surgery, the natural lens is removed and the surgeon replaces it with a new artificial lens implant. Think you may have cataracts? Take our quiz. Want additional information about cataracts? Click here. Have you heard of the wonders of LASIK but have been nervous to experience them yourself? Well, now you can know exactly what to expect thanks to Timie Yancy and her behind the scenes insights. Timie had not been able to see the world without glasses since she was 12 years old. She even slept with her glasses on when her children were babies worried that something would happen and she wouldn't be able to find her glasses fast enough to see and help her children. The thought of LASIK terrified her, not knowing what to expect. Her husband had recommended LASIK for her for years, but she did not want to take the step for fear of what might happen. In June, she decided the gift of a life free from glasses and contacts was worth it and she had LASIK surgery with McFarland Eye Care and Dr. Evan Newbolt. She posted a Facebook live video after her surgery here. More than 2,000 people have watched and learned more about LASIK and how it can changed her life in a matter of seconds. Timie described her LASIK procedure as feeling some pressure, like a foreign sensation. Dr. Newbolt talked her through the entire process, which lasted only 10 minutes. She noticed the difference in her vision immediately, and began seeing the benefits of the procedure on the way home. For Timie, the worst part was not being able to wear her eye makeup for a week after her procedure. "The last time I was able to see the world without the assistance of contacts or glasses was at the age of 12,” Timie said. “Today, at the age of 37 I feel so free. I can wake up and see the beauty of the world immediately without grabbing blindly for my glasses. LASIK surgery is (to me) the 8th wonder of the world. My only regret... I didn't do this years ago!" We know having LASIK performed can be nerve wracking. That’s why we go out of our way to make sure you are comfortable and at ease before, during, and after your procedure. Timie mentioned the massage chairs in the waiting room in her live video. That’s just one way we make sure you are comfortable during your procedure. When we say “Experience the McFarland Difference,” we mean it. Don’t let your fear of the unknown keep you from trying something new. Thanks to Timie and her first-hand account of her LASIK experience, you don’t have to. She broke down LASIK step by step so you can know exactly what to expect before, during and after the surgery. The only thing keeping you from getting LASIK is you. Are you ready to see the world in a new way? 20/20 vision without corrective lenses is an option, and one of the most common comments we hear from our LASIK patients is that they wish that they’d done it sooner! To learn more about LASIK, have your questions answered, or to schedule a FREE consultation, fill out our form below and experience the McFarland difference.